A dark and mystical atmosphere is obligatory for any successful black metal project, but occasionally there are a select few that manage to raise the concept to an art from while also maintaining the necessary metallic edge to keep things from venturing too far into shoegaze/post-rock territory. The old yet all too young Norwegian outfit Astaroth (carrying both a familiar name and a few familiar faces) more than succeeds, but manages to recapture the pure old school spirit of the latter days of the 2nd wave while still embracing the less fuzzy and frostbitten production character that went along with A Blaze In The Northern Sky or Pure Holocaust, two albums that undoubtedly had a heavy impact on Chaosatanas, Astaroth’s long awaited debut LP after 5 years of existence. Arguably the most intricate feature of this album is its unique usage of clean guitars and brief instrumentals to shore up what is largely an exercise in rabid traditionalism with a slight virtuosic edge. 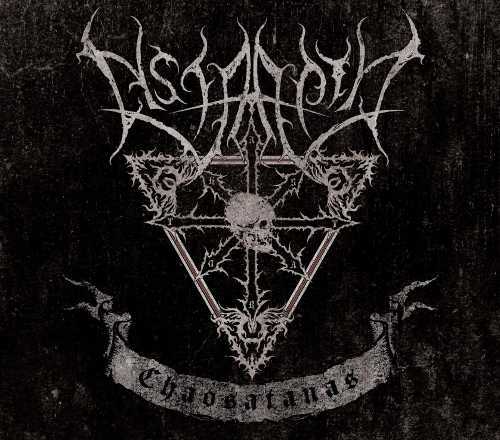 The bulk of what makes up “Intro” and “Ascending” is a dreary and nostalgic interplay of clean guitar lines with a very slight dash of keyboard presence, drawing a very sharp contrast in both the ambient keyboard work of Burzum and the symphonic pomp of Emperor and Limbonic Art, which tend to be the usual approach in this style and might be expected given the presence of Troll drummer Carl Engstrøm in the fold. A lone piano paints the closer “Outro” in a fashion a bit more reminiscent of Varg Vikernes’ minimalism, but apart from that things stay in less familiar territory on the clean section front. But for all the interesting peripheral devices at play, this is an album that leaves its mark with a healthy onslaught of filthy, unfettered aggression after the mold of a recent death metal convert to the black metal style, arguably not all that dissimilar to a cleaner and more precise answer to early Gorgoroth. The blast happy bruiser “Xeper-I-Apep” brings forth the most overt elements from the iconic debut of said band Pentagram while being just a bit denser and flashier. Special note should also be taken of the more varied mixture of chaotic speed with frequent slower, punchy thrash elements “Seth”, which is a bit more representative of the album’s general sound, which definitely makes time for the death and thrash influences of the black metal style in its infancy and merging it with the Norwegian interpretation of the 90s. It’s pretty hard to go wrong with an album like this if an older school sound is the goal, though it may come off just a tiny bit too safe for those craving a really raw, low-fidelity character of sound. Younger fans of the style who aren’t necessarily married to the theatrical imagery and corpsepaint cliches of the style’s early days will find a more down-to-earth take on all things pitch black here, though it gets difficult to picture these guys not looking like a throwback to that visual if the band’s photos aren’t readily at hand. It’s a highly mature and well-rounded listen from a group of musicians that have largely been around the block and while not quite breaking into elite territory, comes pretty close. This entry was posted in Reviews and tagged 2nd wave, A Blaze In The Northern Sky, Astaroth, atmosphere, black metal, Burzum, Chaosatanas, dark, Darkthrone, Death Metal, Emperor, immortal, Limbonic Art, norway, old school, Pure Holocaust, technical, Thrash Metal, traditional.